Claudine Lundgren is an author, artist, and designer of an award-winning iTunes study guide. 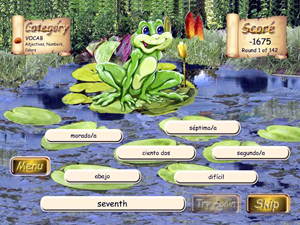 In game format this gift of her experience and many-faceted talents can enhance learning of the Spanish language - for those of any age- (see just below.) 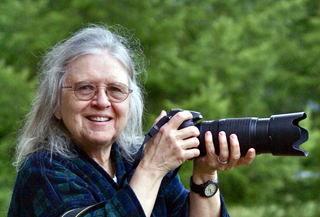 In the stories below, Lundgren reveals her love of creatures, but highlights the tales of wild turkeys, one remarkable deer and her pet goats. Here are stories from her life on the road and on the farm... .
What is it about a country road that makes us want to keep the "country" in the country road? Especially since there are only two lanes, one in each direction with few places for passing slow vehicles. In those first years on our farm, we often had to stop on the road to let horses pass, cows, a tractor, geese or chickens.Once I spotted several wild turkeys pecking in the ditch, close to the road. While there wasn't much traffic, what there was moved quickly and the birds would be in danger. So, I stopped the car to the side of the road, got out and waved my arms to make myself look big, flapped and gobbled as loud as I could at the flock, hoping to scare them away from the road. They stopped pecking at the ground, stared at me with wide eyes, as though I might be a deranged turkey from Mars, and maybe with my hair on fire. I gave up on trying to speak turkey, and they seemed to survive just fine next to the curvy country road. We sadly learned that the deer didn't fare so well on this road, being hit by the big log trucks or motorists who drive as if they are on a freeway, ignoring the deer warning signs. People don't seem to realize how the deer view oncoming traffic. The deer don't understand the concept of roads, going from here to there. What they do understand is that they are following a trail that deer have been following for many, many years. They instinctively know to freeze in their position with approaching danger. Then, just as the danger gets too close and flushes them out, because they believe that they have been detected, they often dart right into the path of the driver with no chance to avoid a collision. We have learned to immediately come to a crawl or stop as soon as we spot a deer close to the road. And, of course, driving more slowly in the first place helps a lot. 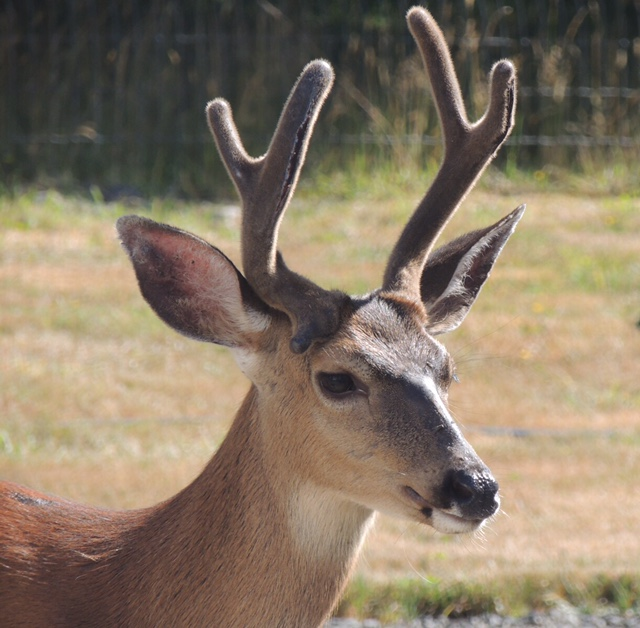 We have had many deer families hanging around our farm over the years, mostly because of our two main forested areas, the creek, and keeping our dogs in a fenced area of the farm. If we sat still on the swinging chair, they would come within 10 yards while grazing, not really tame, but used to seeing us. Our biggest delight has been each July, when the doe would introduce their fawn to the farm. Once in a while we could identify certain ones. One doe had an injured hoof and would drag it in the dirt or snow that made it easy for us to identify. Another had a nick on one ear that was easy to notice. One year we noticed that a couple of the deer had a parasitic disease that caused them to over groom, leaving them vulnerable to the elements and could become life threatening for them. We feared for the deer, and we also feared that their disease would travel to our small herd of Pigmy goats, since they often grazed close to the barn and fenced area. So, we spoke with the local wildlife people and asked if there was anything we could do. They suggested putting out apple bits to keep them coming near and once they became accustomed to finding the apples, to add medicine (used for horses), to the apples. We asked them about it being against the law to feed the deer. They said "well, you know Purina puts out a deer pellet product that is sold in 50 pound bags, so that isn't really the case. 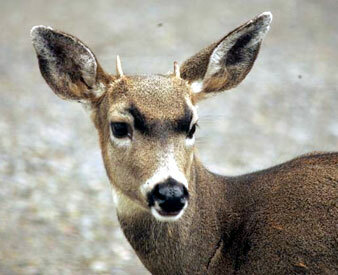 We are more concerned about hunters using baiting methods to attract the deer for hunting. We understand that you aren't trying to tame the deer, but to help them from spreading and/or dying from a disease, and to protect your goat herd." So, we put out the apple pieces in trays when we saw the deer in the area and they soon learned to come often to check the tray and later we were able to administer the medicine with great results. After little time the deer became even more used to us walking around the farm, and we regarded them as part of our farm family. Two years ago, we had a re-occurrence of the deer disease that showed up on two of the fawns. Their mother was used to us, so the babies soon learned that we were not a threat and came running for their apple bits, filled with medicine. The next January, we saw that one of the two fawns had a terribly broken rear leg at the joint. It looked as if it should fall off. We spoke with the wildlife people to come out to put it down. They assured us that it is often that the broken leg would rot off and the deer would survive just fine. Horrifying as it sounded, we wanted to do the right thing. They again coached us to put apple bits out, to keep the deer from wandering off onto the road or to another farm where someone might shoot it or find itself at the mercy of big farm dogs. It seemed unbelievable that the poor little deer could survive, but it stayed close to the apple tray, which was in view of the house windows, so we had a good way to monitor the progress. It was very hard for us to see him hobble around. We weren't convinced that this little buck would survive, but watched his gradual progress and decided to call him Tripod, thinking that he would lose that leg. But, as the months passed, we watched in disbelief. There he was, walking on his mended leg. And now that he is so accustomed to the apple tray, we have a frequent visitor. But, we worry. About him trying to cross our country road. 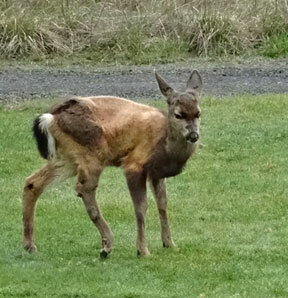 Although he is fully recovered, he kind of seems like "our" little buck. And, it's almost hunting season. His little spiked horns will turn him into an instant target on the days that he wanders off of the farm. But, that's part of the cycle of life, on this country road. And, after riding in the traffic of Chicago last week to visit my cousin, I am happy to drive slowly on this old country road. Somehow Tripod and his mate have survived the hunting season, and now another year, another hunting season and the mating season, and the country road. A little drama on the freeway today. I was in the fast lane, a school bus was flanking my right in the slow lane. We both slowed as we came to two cars stopped in the slow lane and could see what had made them stop. 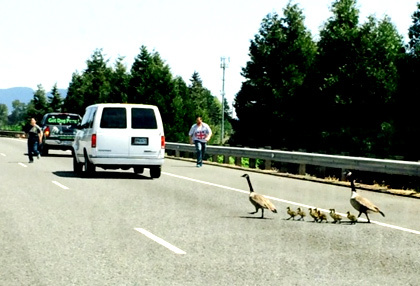 There was a family of Canada Geese with 8 babies, trying to cross the freeway. I stopped my truck in the fast lane and grabbed my camera. The school bus stopped the traffic in the slow lane. The doors flew open on the front car that had stopped and two people started to run towards the family of geese that hadn't quite got the right idea yet and were coming towards my truck. So I jumped out and the three of us made a sandwiched effort to guide the family off of the freeway and down the slope from where they had waddled. As I turned to run back to my truck, I could see two very long strings of vehicles stopped behind us. Not one horn honked, not one fist waved, not one nasty word did I hear. I waved thank you and we drove on... so glad that I hadn't taken the usual freeway to our turnoff. But then, when I got onto our old two lane country road, I saw a color in the field in my peripheral vision that clicked 'wrong'. It was not a deer, but it was brown and I know that they only have black cows there. 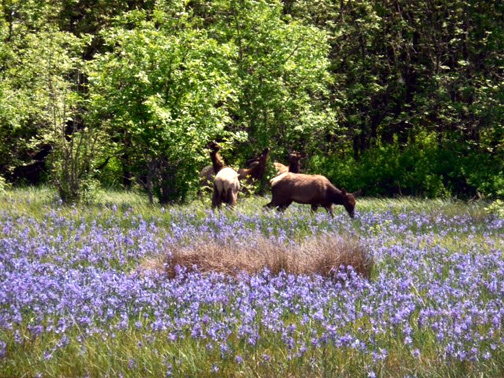 So, I dared a glance and sure enough, an elk was standing in the middle of the field of blue Camas. I screeched to a stop and jumped out with my camera. Then it dawned on me that I was in their path and maybe causing them pause for coming this way. Just then another car pulled over to look at the herd. The herd turned and went back towards the hills where they usually roam. What a rush. They are such magnificent animals. Pigmy goats are so delightful, each with his or her own personality- gentle and caring and willing to investigate anything you happen to be doing. Their spirit of playfulness is such a pleasant break from ordinary reality that tends to hang on one's ears. Trimming goat toe nails and giving them their worming medicine is more like a wrestling match than a trip to the beautician. There were two of us tackling goats today. Once they are onto us trying to catch them, they each turn into flying banshees, ricocheting off of the walls of the stall, jumping over each other and bumping us onto the bales of hay. It is really quite a comical circus act, even though we've got it down to minimal panic on their part. Our part, not so much. Then comes the holding them still enough, long enough to use the sharp shears on each hoof part. 'Turn to the other side please' doesn't get the wished response. Nor does 'lift your foot please'. I haven't figured out which one of us grunts more or who really farted. I only stabbed one toe by mistake this time and it only bled long enough for me to plaster on the Stop Bleed powder. THANK SOMEBODY for inventing that stuff! Each time we say 'Why didn't we call the Vet to do this?' Then we remember the answer. It's too far away for them to bother, or they end up having us help them catch and hold. Then they make every other toe bleed from trying to do it too fast, terrorizing the goats further. We also found that they don't really trim them well and we have to turn around and do it sooner than usual the next time. So, we gather our farm duds and prepare to be dragged through the goat doo doo and get half of the medicine squirted onto us instead of into their tight clenched mouths. Re-load and try again. 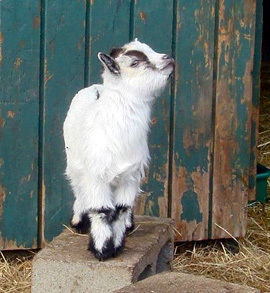 OK, next goat. Thank goodness we only have six. And thank goodness by dinner time they seem to have forgotten the whole thing. But tonight my body is going to enjoy soaking in the tub to see if I can get my muscles to forget the whole thing. We won't even talk about the straw in my hair and ears. Work? Hah! That's only once each four months. The real work is the daily keeping them out of trouble, (like getting a leg tangled in the twine from a bale of straw that they've broken, or their collar caught on wire they've snapped) watered, fed, and the weekly cleaning out of their stalls and supplied with a years worth of hay to eat and straw to sleep on. And, that's when they are healthy. 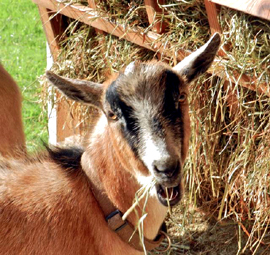 A sick goat could mean shots, temporary isolation and special feed. So, why do we do this insanity? Because Pigmy goats are so delightful, each with their own personality, gentle and caring and willing to investigate anything you happen to be doing. Their spirit of playfulness is such a pleasant break from ordinary reality that tends to hang on one's ears. Maybe it's just the sweetness you can see in their huge, curious eyes. Refreshing and delightful play friends, makes it all worth it. They are so much joy, that it makes me want to share. Besides, squatting in the poo'd straw, to get to the underside of a goat once in a while, might make me grow taller. I just knew you couldn't wait to know all of this about us ol' goats.